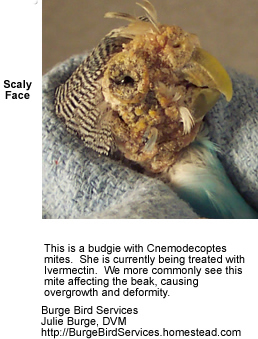 Scaly Leg or Scaly Face are most commonly caused by Knemidokoptes - also spelled Cnemidocoptes, which are eight-legged microscopic mites that are related to spiders, ticks and scorpions - but obviously much smaller in size. They burrow in the face, feet and leg, vent and wingtips. Different species of mites affect different species of birds. 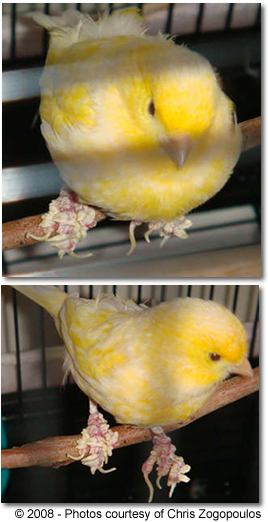 Knemidokoptes are most frequently found in budgies; however, they have also been reported in other species of birds. In canaries and finches, the same mite causes a condition commonly called 'Tassle Foot'. It is also likely that some birds are genetically more susceptible to these mites than others. Any swellings could also be caused by strangulated fibers or insect bites.